A multi-vehicle crash led to the closure of the A90 in Aberdeenshire on Monday evening. Emergency services were called to the incident near Foveran around 8pm. Police said multiple vehicles were involved in the crash. The road was closed in both directions while the incident was ongoing and drivers were advised to avoid the area. A North East Police Division spokesperson said: "Police Scotland along with other emergency services are currently dealing with a multi vehicle RTC on the A90 at Foveran. 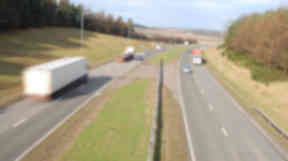 "As a result the A90 is currently closed in both directions between the A975 and B9000. Diversions are in place at these junctions. Please avoid the area if possible." The road was fully re-opened shortly before 10pm.